Use coupon code KCM. Discount applied at checkout. Steinberg, National Director of Policy and Advocacy for U.S. Pain Foundation. 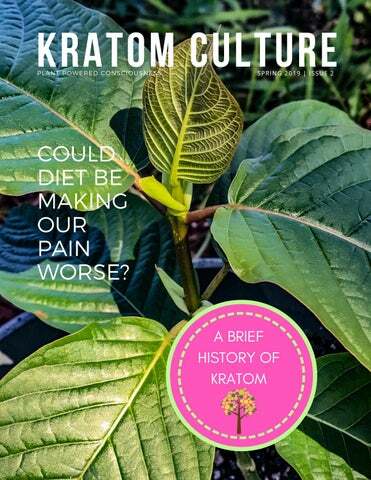 Kratom has saved millions of lives. We must continue to fight as if our lives depend upon it - because they do! Quietly Admits It Screwed Up Counting Opioid Pills." AKA STATEMENT ON KRATOM CONSUMER PROTECTION ACT While it is unfortunate that the FDA is not protecting kratom consumers under their existing authorities in the Food, Drug and Cosmetic Act, the individual states are on their way to acting responsibly to protect kratom consumers. While it has been an enormous challenge from a financial standpoint for AKA, there are now lobbyists working in the following states to promote similar legislation: Utah Passed both Houses, enrolled for Governorâ&#x20AC;&#x2122;s signature Arizona Assigned to House Health Committee Rhode Island Assigned to House Health Committee Georgia Passed the House in a 164-1 vote Missouri Filed, in Rules Committee for Committee Assignment Idaho Filed, awaiting Committee assignment Michigan Filed in 2018 session, awaiting new filing in 2019 Oregon Legislative Counsel Kansas Legislative Counsel Nevada Filed, awaiting Committee assignment Wisconsin Bill being drafted We are committed to pass the Kratom Consumer Protection Act in as many states as possible, and we are extremely grateful to those who have made the financial sacrifice to allow for lobbyists to be deployed in these states. O Sacred, Wise, and Wisdom-giving Plant,Â Mother of Science, Now I feel thy Power Within me clear, not only to discern Things in their Causes, but to trace the ways Of highest Agents, deem'd however wise. Mitragyna speciosa is native to Indonesia, The Sunda Isles, Thailand, Malaysia, Laos, and Vietnam. Thailand is where most of the information about natives using it comes from, though the cultural connection is rarely found in the northern/northeastern parts. Reportedly it grows abundantly in central and southern Thailand (at least it used to, eradication efforts by Thai authorities have reduced the Mitragyna speciosa population incredibly). 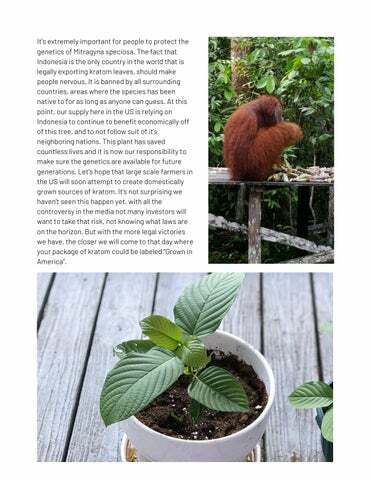 Borneo is the world’s 3rd largest island. The island is split between the countries of Brunei, Malaysia, and Indonesia. The place Mount Kinabulu, and next to Mahakam River, is a specific place on the island mentioned in the kratom community where Indonesian kratom is grown and then exported all around the world. There are communities of Indonesian farmers on Borneo island that farm kratom for a living. The island of Bali was and is a major exporter of kratom, and people argue on whether or not kratom that is sent from there actually grows there or not. It appears that most of it comes from Borneo or elsewhere. When a package of kratom is labeled “Bali”, it’s probably more of an indicator of the type of leaf blend it is, and not where the kratom itself actually originated. It’s up for debate whether or not all the kratom we receive here in the US, was originally grown in Indonesia and many even claim most all comes from Borneo. The reason this is unconfirmed is because it is banned in Thailand and some of the other countries we see with the names of strains, so it is difficult to verify the origin of shipments. This applies to Vietnam and Malaysia as well, as it is banned in these places yet we receive strains like “Yellow Vietnam” and “Green Malay” here in the states. 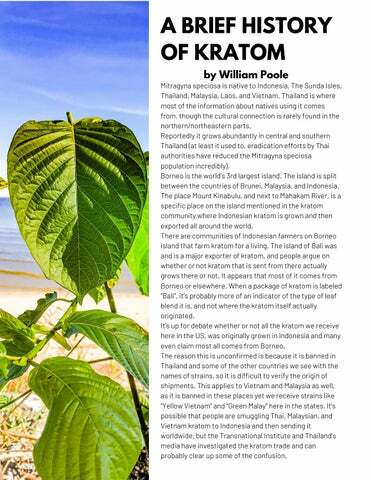 It’s possible that people are smuggling Thai, Malaysian, and Vietnam kratom to Indonesia and then sending it worldwide, but the Transnational Institute and Thailand’s media have investigated the kratom trade and can probably clear up some of the confusion. It's extremely important for people to protect the genetics of Mitragyna speciosa. The fact that Indonesia is the only country in the world that is legally exporting kratom leaves, should make people nervous. It is banned by all surrounding countries, areas where the species has been native to for as long as anyone can guess. At this point, our supply here in the US is relying on Indonesia to continue to benefit economically off of this tree, and to not follow suit of it’s neighboring nations. This plant has saved countless lives and it is now our responsibility to make sure the genetics are available for future generations. 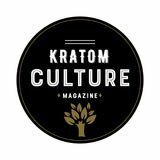 Let’s hope that large scale farmers in the US will soon attempt to create domestically grown sources of kratom. It’s not surprising we haven’t seen this happen yet, with all the controversy in the media not many investors will want to take that risk, not knowing what laws are on the horizon. But with the more legal victories we have, the closer we will come to that day where your package of kratom could be labeled “Grown in America”. What's hiding in your food? Sugar can be hidden in food. Anything that ends in "ose" is sugar. For example, lactose, fructose, sucrose, and corn syrup are some common ones to look out for on labels. Also, just because something is labeled "gluten free" does NOT mean it's healthy. Food companies simply replace gluten with ingredients such as potato starch, brown rice syrup and others. These can still be problematic for many of us. "Research examining the connection between nutrition and pain at the molecular level focuses mainly on polyunsaturated fatty acids (PUFAs), which are plentiful in the diet and serve important roles in the immune and other biological systems in people. Some PUFAs can promote or lessen inflammation. Omega-3 PUFAs, found in fish and nuts, for example, are antiinflammatory, whereas omega-6 PUFAs, found in processed and fried foods, can tip the body’s balance toward inflammation, a process known to worsen chronic pain," writes Stephani Sutherland for Relief: Pain Research News. The biggest ingredients to watch out for that might be worsen pain are sugar, dairy and grains. It has been suggested that the Keto or Paleo diets are effective at reducing pain, but more research needs to be done. However, that doesn't mean you can't make changes and see if they work for you. After all, we all respond differently to food. "It may be hard to resist desserts, pastries, chocolate bars, sodas, even fruit juices. However, the American Journal of Clinical Nutrition warns that processed sugars trigger the release of inflammatory messengers called cytokines. Sugar goes by many names so look out for any word ending in “ose,” e.g. fructose or sucrose on ingredient labels," writes Matt Atherton. Think eating healthy is out of your budget? Follow these tips starting today! PAIN AND DIET The health benefits of whole food When I first learned about the Paleo Diet, I thought, there's no way I can follow this! It's too restrictive. But then, I kept getting sicker and sicker with longer bouts of being unable to get out of bed. I kept hearing stories of people who had either gone totally Keto, or turned to Paleo or the Whole 30 lifestyle with great success. There's no doubt that this change has been extremely difficult, as it means cooking all my meals at home, which is time & energy consuming. But, being sick is much, much worse. In the long run, it's cheaper to eat at home and to pick foods that aren't going to cause me to flare. Foods that cause me flares are grains, dairy and sugar. Your response may be different. Pay the farmer now, or pay the pharmacy later. Old proverb. very little space in your windowsill! Farm fresh from the source. It's extremely important for people to protect the genetics of Mitragyna speciosa. The fact that Indonesia is the only country in the world that is legally exporting kratom leaves, should make people nervous.